In 1895 Angelo Filippo Onofrio immigrated from Italy to Chicago where he applied his trade working for the Lyon & Healy Piano Co. In 1898 he moved to Denver, Colorado where he started a piano business in a building behind his home. The city was a tiny provincial outpost on the fringe of civilization. The total population of the area was around 50,000. Income levels were well below the national mean and the biggest market for pianos consisted of saloons, bordellos, and the occasional rancher or miner who made good. In 1900 he opened the Colorado Music Company in the Adams Hotel. Later he moved into his own building on 15th and Welton. Filippo’s main lines were the Kroeger, Lyon & Healy and the Columbine Piano which was made exclusively for him by Steger & Sons in Chicago, Il. You can still find Columbine pianos throughout the Rocky Mountain Region. Having been in an arid climate for their entire existence, most of these pianos are in far better condition than other uprights that immigrated over the last hundred years. When Filippo’s son Joseph graduated from high school in 1914, he went back to Chicago, to study piano building and perfect his skills as a piano technician. 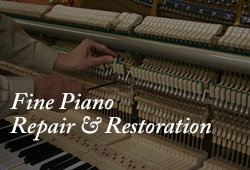 Upon returning to Colorado, Joe joined his father selling and servicing pianos. Angelo and his son covered a wide territory including Colorado, Utah, Wyoming and New Mexico. Typically they would spend the summer and fall making a circuit, tuning pianos and selling new instruments in the booming gold mining towns and to the burgeoning establishments in the cities. They traveled the long distances by train, and then once in a populated area, by bicycle. When a piano was sold it was shipped by train to the nearest junction and then taken by horse and wagon to the purchaser. In 1928 Filippo died of asthma and one year later the great depression devastated the piano industry. Joe continued his father’s business, but out of a much smaller location in north Denver. To supplement his piano business he entered politics and worked for the city of Denver as an assessor. He was later appointed by Mayor Ben Stapleton to head the Department of Motor Vehicles. In 1946 Joe resumed his piano efforts full time and opened a new store at 18th and Broadway, renamed the Joe Onofrio Music Co. His Son, Joe Jr. had just returned from service in the pacific theater and he opened a second location on 7th and Santa Fe. During the boom years following WWII their business prospered and in 1952 the father and son joined forces to open a single large store near the civic center.In 1962 Joe senior died at the age of 65, leaving Joe Jr. to carry on the family business. Through the 1960s the business continued to expand until it encompassed half a city block with showrooms, repair and refinishing facilities, and a warehouse. Selling some of America’s finest pianos such as Knabe, (then official piano of the Metropolitan Opera), and the world famous Mason & Hamlin, Onofrio Piano had positioned itself as a leader in the Denver market. 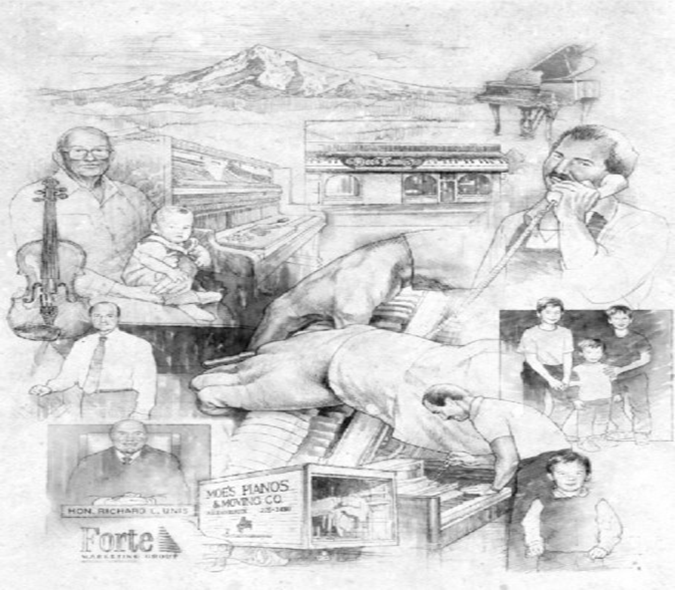 After a long run as one of Denver’s leading piano retailers, Onofrio Piano suffered several setbacks in the late eighties. First Joe Onofrio Jr. died unexpectedly in 1984 at the age of 61. Then in 1985 Aeolian, (the maker of Mason & Hamlin and Knabe), closed its doors and Onofrio lost its major lines. The popularity of Asian pianos during the ’70s and ’80s, especially Yamaha, had impacted American piano builders to such a degree that there were no new piano lines available. The final blow came when Colorado’s energy business went into a steep slump, causing a state wide recession. An so, like many other piano businesses, in Colorado and across the country, Onofrio was looking at its options. This included diversifying with other musical instruments during this time. In 1991 Joe Onofrio III returned to manage the family business after a 10 year absence. He had worked with his father as a technician in the ’70s and ’80s but left, after graduating from Regis University, to work in the bicycle industry. With no new product lines to represent, Onofrio ramped up the back room, to provide a steady supply of saleable used pianos. He hired Marshall Luke, a talented local piano technician who had worked with Joe Jr. to reorganize the technical department. When he secured the Baldwin line in 1992 the company expansion shifted into overdrive. With Baldwin, “America’s Best Selling Piano,” to anchor the product mix, others were quick to join and Onofrio quickly regained it’s market share. In the years from 1991 to 1998 sales increased 600% and once again, Onofrio was one of the region’s leading piano retailers. Then when America’s iconic Baldwin Piano Co. of Cincinnati discontinued building pianos in the U.S. and moved essential manufacturing operations to China, Onofrio Piano Co. saw the handwriting on the wall and began to seek representation of “top-tier” world class pianos including Bösendorfer and Estonia. But Joe, Jr. also needed new blood and new “bread-and-butter” piano lines to sustain and grow the business that his grandfather had started. The story of a family's passion for pianos ― the legacy of a grandfather’s influence on future generations, the impact of The Great Depression, and of how at least four recessions of the late twentieth and early twenty-first centuries forever altered the piano business in the United States — began in 1926 when Maurice T. (“M.T.”) Schuster moved from North Dakota to the Pacific Northwest to audition for a job as violinist with the Portland Symphony Society. Although established in 1896 as the sixth oldest and one of the fifteenth largest orchestras in the United States, the orchestra’s regular concert season was suspended in 1938 due to economic circumstances. The Great Depression of 1929-1941 — and the threat of war and budget deficits — led M.T. Schuster, in 1935, to start earning his living by tuning pianos. When the Works Project Administration (WPA) launched the Portland Federal Symphony Orchestra, a government assisted program to save America’s failing orchestras, M. T. Schuster was hired to play second violin. September 28, 1937, when Franklin D. Roosevelt came to the Pacific Northwest for the President’s Dedication of Timberline Lodge, the orchestra (and M.T.) played for the ceremonies at Mt. Hood. In 1946, Maurice T. Schuster went into the piano business full time when he arranged shared occupancy adjacent to an upholstery shop on Southeast 17th Avenue, in Portland’s historic Sellwood District. When his daughter, Gloria, got married in 1952, M.T.’s new son-in-law, Richard Unis, took an interest in pianos. Upon finishing law school, Unis went to work in the piano shop for his father-in-law while studying for the bar exam. After passing the Oregon State Bar, Richard Unis and his best friend from law school, Bob Amacher, rented a store at Southeast 39th and Belmont and opened A-U Piano — combining the initials of their family names. Just around the corner on 39th Avenue, they hung out a shingle for their law practice. Their joint venture ended in 1955 when Unis went into the service as a lieutenant and moved his wife to Wright Patterson Air Force Base. He never returned to pianos: Richard L. Unis began serving his first judgeship in 1968 and retired from the Oregon Supreme Court in 1996. However, Gloria and Richard Unis’s son, Maurice, named after Gloria’s father, Maurice T. Schuster, would carry his family’s passion for pianos to a level of national prominence — way beyond the dreams and expectations of his parents and grandparents. Maurice (“Moe”) Unis went on to become the founder and president of Moe’s Pianos and of the Forte Marketing Group. In turn, Maurice’s own sons would grow up mentored and trained in the piano shop to become the fourth generation of Schuster-Unis descendants to carry on the family’s vocation. 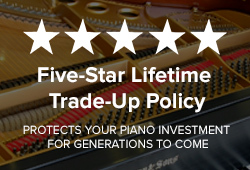 In the late 1980s, with huge sales…having built Moe’s Pianos into a successful business during the turbulent 1970s, despite the decline of many other piano retailers and American piano manufacturers during this period…Maurice Unis rose to national recognition. 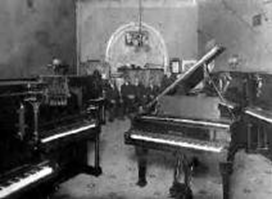 As one of Steinway’s leading U.S. dealers, he received an offer from Sherman Clay & Co., headquartered in San Bruno, California, to purchase Moe’s Pianos. With chain stores throughout California, Washington, Arizona, and Texas, Sherman Clay & Co., having closed its previous Portland store, now wanted back in the Portland market. Meanwhile, Maurice’s now-grown-up sons began taking a serious interest in their dad’s business. From early childhood they’d watched him disassemble, clean, repair, and refinish pianos — in the shop, the family garage, and even in the living room. They, too, were hooked on pianos as a lifelong vocation. In 2001 Maurice Unis and his eldest son, Brian, opened Classic Pianos — next to Portland’s Aladdin Theater — in a historic building that had earlier housed a violin maker. Two key players in the development and success of Maurice Unis’s Forte Marketing Group and Classic Pianos were Don West and Chris Ranney. 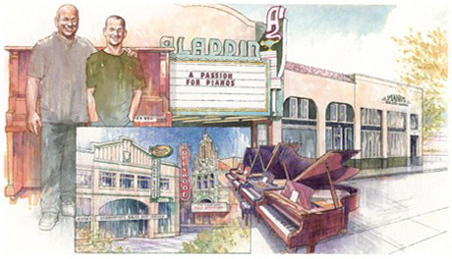 By 2005, Maurice Unis’s “piano campus” had grown…especially with his 2005 acquisition of Cascade Music Co. and an exclusive Yamaha dealership…to include ownership of several adjacent buildings in Portland’s historic Brooklyn Neighborhood, including an old-world Restoration Shop, three Historic Showrooms, a Recital Hall, Teaching Studios, and a restored (circa 1912) Piano House and expanded condominium. Then in 2008, at the invitation of Yamaha Piano Corporation, Classic Pianos was invited to take over sales for the Seattle area in the Bellevue store that was earlier run by Washburn Piano Company — now out of business. Classic Pianos of Washington was appointed as exclusive Seattle area representative for Bösendorfer, Yamaha, Schimmel, Estonia, Vogel, Cable Nelson, Disklavier, Clavinova, and AvantGrand by Yamaha. Alaska was added as marketing and sales territory for Classic Pianos in the months that followed. The long road from North Dakota to the Pacific Northwest, and the legacy of four generations in the business of selling and servicing pianos, was only beginning. 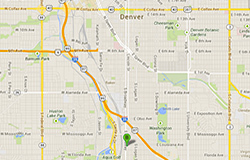 Further expansion eastward included piano stores and affiliations in Cleveland, Albuquerque and, in 2012, Denver. Don West and Chris Ranney moved to Denver and were appointed managers of the reorganized Onofrio Piano Co., representing some of the world’s most sought after names in piano making Yamaha, Bösendorfer, Schimmel, Estonia, Hailun, Young Chang, and other famous names – plus Vintage-restored Steinways. Now through its national network affiliations with Portland, Seattle, Alaska, Cleveland, and Albuquerque, Onofrio’s would have access to over 300 new and used pianos. Maurice Unis and his team of piano professionals in six U.S. markets has won every Top Dealer and Outstanding Customer Service award from every manufacturer he represents for the past three years running, as presented at the annual National Association of Music Merchants convention in Anaheim, California. 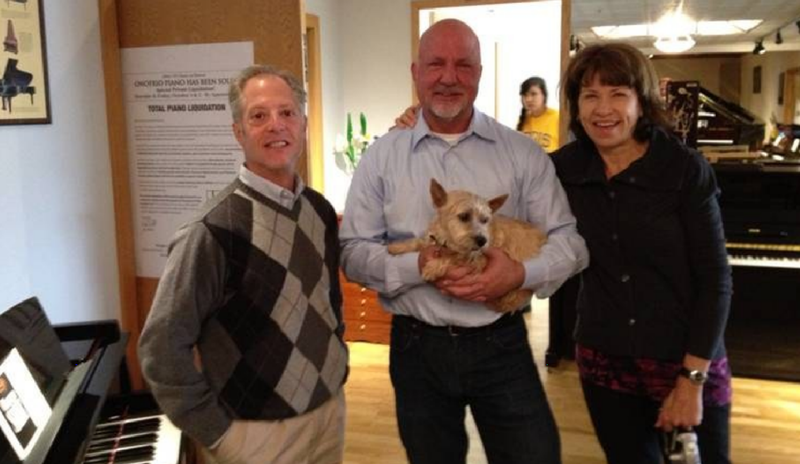 Maurice R, Unis, Cathy Traylor Unis, and their dog Casey.